Learn English Newsletter Audio...What do you think? I created this page so you can provide me with your personal thoughts and comments on the new audio that I recorded in the October edition of the Learn English Newsletter. -Did you find the audio interesting? -Was it easy to understand? -What kind of topics would you like to listen to? -Would you like to be able to suggest topics for me to record audio about? -What could I do to make the audio more useful for you? Providing me with feedback is a wonderful way to get exactly what you want and need. If you tell me what you want then I will be able to provide it for you. Take just 5 minutes (or even less) to tell me what you think about the audio and I will make it both useful and interesting...just for you. Thank you in advance for your comments and feedback below. 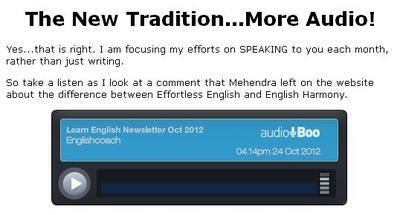 Comments for Learn English Newsletter Audio...What do you think? Hi, what I can do to listen to this audio? The first thing would be to sign up for my free monthly newsletter. Then you will gain access to the monthly audio that I record. You can also visit my audioboo page where I post most of my audio. I am glad that you enjoyed the audio message. For now I am only providing the audio as mp3 files (via Audio boo) but I hope to create more audio programs (possibly on CD) in the future. Many thanks for this idea...but it needs some clues (help) for a better understanding. Maybe providing the transcript or getting visitors to suggest what they think you are saying and then providing the full transcript later. I am frustrated that I can't hear to the audio at audioboo.com. It is not fair because I am deaf. I really want to learn how to write and read English. We appreciate your effort. Your speed was right it was easy to understand what you are talking about. For sure I will wait you to add more Audio. For me listing to Audio was the best way that help me understand & improve my English. Your speaking is very nice! I can understand very well! I would like to say, thank you very much for helping us to improve our English. Very good and helpful to us teachers. A commint on the audio!!!! It wasn't that slow too cause sometimes when native speakers talk slowly to get non native speakers to understand them...well it sounds boring and the listener may lose interest in the whole thing. So it was helpful and sounded good to me. Hi, I'm learning English, and hope to improve my English by reading and listening to your Audio to speak with confident. I'm one of your readers and I wanna say that's a great idea to add audio in your newsletters. The audio was a little quick for me though but never mind. I'll do my best to get it. Thank you for your hard work. That's a big help to me. Appreciate it. Join in and write your own page! It's easy to do. How? Simply click here to return to Newsletter Subscriber Feedback!.